NOTE: Please share this with your facebook friends and twitter followers by utilizing the icons to the left. 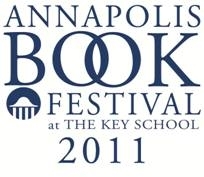 Nationally renowned authors Gwen Ifill, Michele Norris, Annette Gordon-Reed, Peter Bergen, and Norb Vonnegut are among many distinguished speakers scheduled to appear at the 2011 Annapolis Book Festival on Saturday, April 9, at The Key School. This free community event runs from 10 a.m. to 4 p.m. and features more than 40 prominent authors, as well as book signings, new and used book sales, and numerous family activities. The festival draws approximately 3,000 visitors each year. Several festival panels will be broadcast live on C-Span’s Book TV. Featured panels include a discussion about race in America with Washington Week moderator Gwen Ifill and co-host of NPR’s All Things Considered Michele Norris. In commemoration of the 150th anniversary of the Civil War, professors and authors, including Harvard’s Pulitzer Prize-winning Annette Gordon-Reed, the U.S. Naval Academy’s Craig Symonds, University of North Carolina’s Joseph Glatthaar, and lecturer Harold Holzer, will reflect on the historic events and press coverage of the Civil War and its aftermath. Authors slated to discuss ‘man’s best friend’ include National Geographic, Discovery Channel and PBS documentary producer Meg Daley Olmert and Humane Society president and CEO Wayne Pacelle. Panelists also include Washingtonian magazine editor Garrett Graff and former New York Times reporter David Shipler considering the rights of the people. Author Jehanne Wake examines the lives of the Caton sisters of Annapolis — granddaughters of Charles Carroll, signer of the Declaration of Independence. In addition to author appearances, the 9th annual festival includes family-friendly entertainment and educational performances, as well as a variety of interactive children’s activities and a silent auction of storybook-inspired furniture. The Annapolis Book Festival is held on the campus of The Key School at 534 Hillsmere Drive, Annapolis, MD, 21403. Designed to promote and celebrate reading among all ages, the event is free and open to the public. Visit www.keyschool.org/annapolisbookfestival for more information and a complete schedule of events. Follow @KeySchool on Twitter for the latest #AnnapolisBookFestival updates. Why is War the Answer? Larry Doyle—author of Go Mutants!